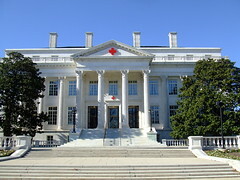 Rose Percy’s long stint with the American Red Cross comes to close today. The 23-inch, Tiffany jewelry wearing,wax doll is being auctioned off in an effort to expunge the $33 million budget deficit the Red Cross has amassed over time. Rose isn’t the only treasure being sold. Nurse uniforms from World War I in addition to the numerous other historical items from the Civil War era and before will be the hot items to spot in the auction. All proceeds from today’s auction will benefit Red Cross general fund, which aids in the effort to execute their humanitarian mission. To see a complete list of auction items, click here. I understand the posters and uniforms, but how did the Red Cross acquire the bejewled wax doll? Seems like this could be good fodder for a book to be turned into a film.